In recent years, the American political landscape has become paralyzed by a toxic combination of partisan extremism, legalized corruption by moneyed interests, and an obstinately “neutral” media that calls every argument even. Unfortunately, this political climate has bred a situation where one political party has become diluted in its policy preferences while the other is growing increasingly irrational and unstable. The national Republican Party has attempted to purify itself of almost every representative who does not share in an extreme right wing ideology—even longstanding conservatives like Mitch McConnell are facing ouster from even more extreme right wing candidates. Outside money from partisan interests (ex. the Koch brothers and Walton family) has driven this process, and now these highly extreme politicians have gained enough power to manipulate the GOP in its entirety. Today, the party line of the GOP is so extreme that it rejects reality and prefers to live in an alternate universe—in this world, climate change isn’t a problem, all regulation is communism, taxes are always too high, the market will work best for all Americans if it is left to its own devices. The GOP’s partisan purification displaces moderates from the party and forces some to find refuge with the Democrats. While this distillation party shrinks its ranks in the electorate, partisan gerrymandering and the high levels of motivation among their extreme constituents have allowed the GOP to retain enough representation to obstruct the legislative process. The Democrats support cap and trade, which is the center-right, market-based proposal that the GOP once supported. The Democrats passed ObamaCare, which is the center-right health insurance solution that the GOP championed as the alternative to single-payer or nationalized healthcare. Beginning with pro-corporate Democrats like Bill Clinton and the blue dogs making common ground with the right wing, the Democrats have steadily moved to the right. What was once the Republican position is now the Democratic Party platform and what was once the Democratic Party platform is considered extreme-left (or socialist by the GOP). When combined with the need to compromise with the extreme-right GOP, this rightward shift for the Democratic position has resulted in the implementation of solidly right wing policies. The dilution of the Democratic Party ideology with centrists and GOP refugees has eliminated the power of the left within the party. Currently, the American left is largely adrift and without substantive representation in office—it is certainly true that members of the House Progressive caucus and senators like Elizabeth Warren are representing a truly-leftist agenda, but they are hardly in control of their party. 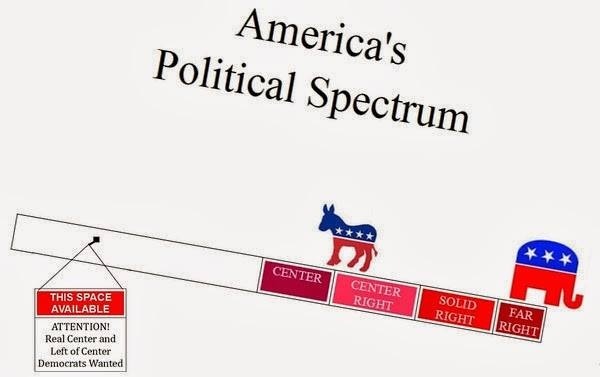 In effect, the entire political spectrum has been shifted to the right and the American people have been left in the dust. Just because the acceptable views of Washington partisans changes, it doesn’t mean that the opinions of those who they theoretically represent do. 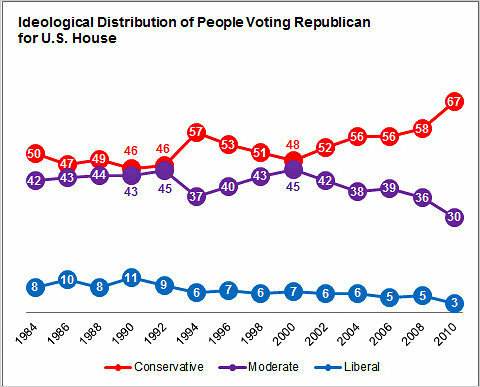 Large portions of the American population are now being forced to choose between voting for a Democratic Party which doesn’t support their ideals and a Republican Party which has suffered a collective psychotic break. Unfortunately, the media has largely ignored its duty to report the facts objectively and has neglected to point out these shifts in the partisan landscape. The media portrays the Democrats as representing the left and the Republicans as representing the right, while, in reality, the actual policy consequences of negotiations between the parties shifts underneath the surface. It is terribly frightening isn’t it.